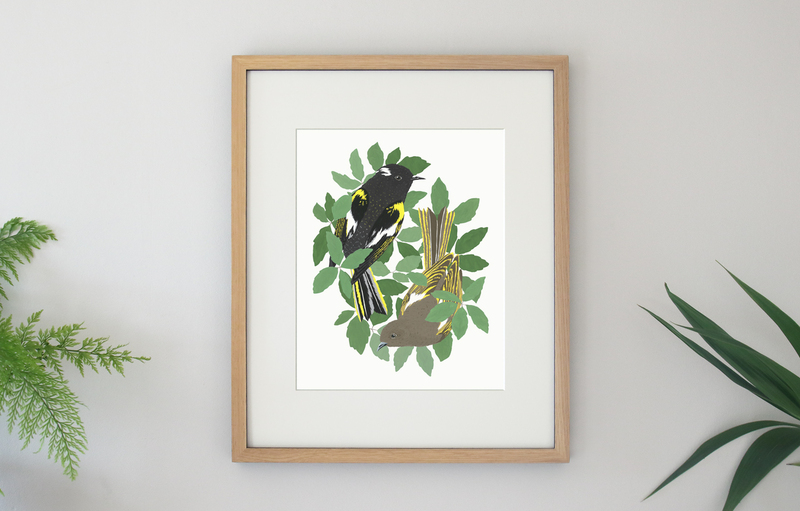 Design Assembly recently got the opportunity to chat with illustrator Melissa Boardman to find out more about her delicate work with native birds and her environmentally sustainable practice. Can you tell us a little bit about who you are, what your background is, and how you first got started in the industry. 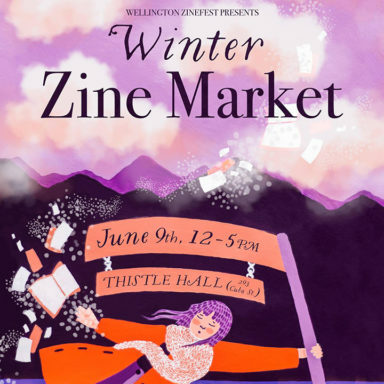 I’m based in Wellington, but am originally from further north, I love nature, animals, photography, patterns, rainy days, my two kittens and having a studio at home where I can work away on my illustrations, while spying on the birds outside my window. 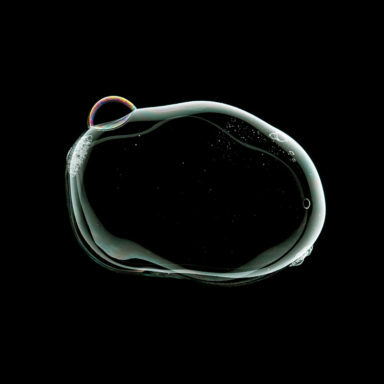 I studied photography at university but didn’t see myself making a career out of it, so I got a job at a printing company. After a while I ended up craving creativity, I developed an interest in native birds, started taking lot of photos of them but wanted to use my photos to create something practical. Stationery was a natural choice as I’d always loved paper goods and it was something I could make in an environmentally friendly way – that was really important to me. My first range of stationery was based on my wood block prints, but I gradually moved to illustrating in Gouache. I started selling at craft markets, got a few wholesale stockists and have continued trying to grow my little business since. Currently I sell my illustrated products at markets and local pop-ups as well as through my online shop. I make calendars, greeting cards, art prints, tote bags, and most recently have started selling my own illustrated ceramics. I consider my style as quite bold and graphic, although I’m always trying to incorporate more detail into my work. I paint with Gouache and I really value retaining texture and the hand painted look. It’s taken me a lot of experimenting and practice to develop my own illustration style and I’m always trying to improve. Getting to share my passion for native birds and being able to share their conservation stories along with my illustrations is a really exciting. I really love talking about birds, whether on social media or in person at markets, it’s a real pleasure seeing someone’s face light up when they see their favourite bird as a print or card that they can take home to treasure. Learning new skills also excites me, I spent last year learning about pottery and figuring out how to translate my illustrations onto ceramics. It’s been such a long process but it’s been really rewarding having started as a complete newbie and learning through trial and error the intricacies of making and firing ceramics. My days usually start with a nature walk, I’m extremely lucky to live between a few patches of native bush, (Zealandia and Otari-Wilton’s Bush) so I get amongst nature as often as I can. I try to make the most of the natural light and do my creative work during the day, which can vary between working on new illustrations for prints or products, designing patterns, preparing illustrations for ceramics, and making products for markets. In the evenings I do my emailing, researching, prepare and pack up any online orders, and plan my next days tasks, all the things that I know would otherwise distract me in the morning! I would probably say the calendars I make. I have been making them for five years now, and every year the theme and illustrations change and really reflect how my illustrations are improving. The first year I made them they got a lot of attention online, they even got featured on blogs like Design*Sponge and Miss Moss, it was quite overwhelming. 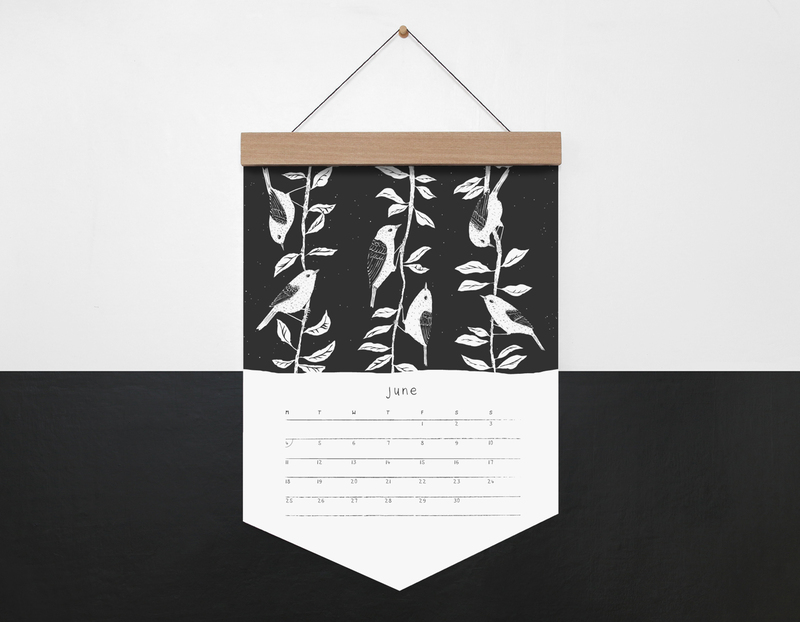 They aren’t your typical calendar, they are cut into a unique shape and made with handmade reusable wooden hangers with a hanging system that I designed myself. People seem to appreciate the effort I put in to making them as eco-friendly as possible. So many things! 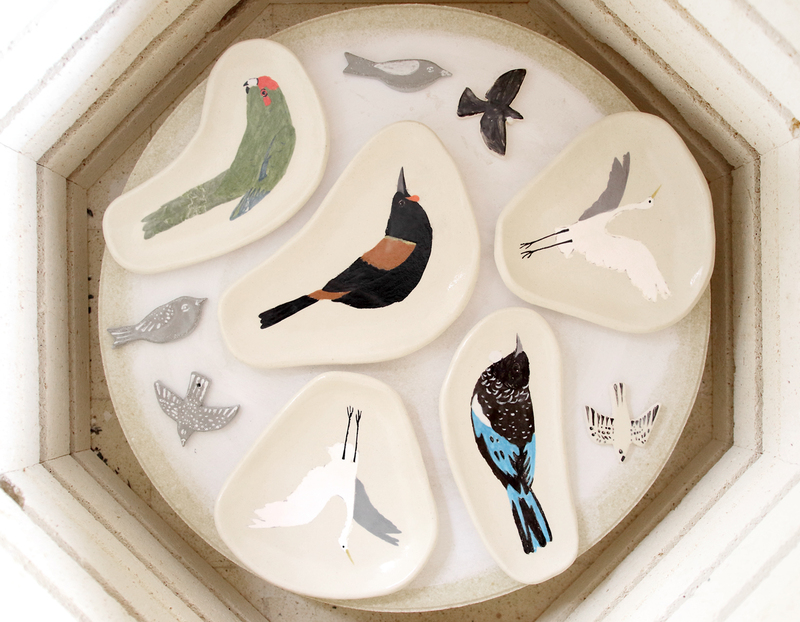 I’ve been spending most of my time illustrating next year’s calendars, and I have just released a new range of prints featuring some of our most iconic birds, also I’ve been making ceramic jewellery dishes with underglaze illustrations. I’m working on a range of ceramic planters too, made with coloured clays that I’m testing at the moment. My sister and I have recently got ourselves a small kiln, and once a week I go to our studio in her garage, just north of Wellington and make ceramics. Where you do you draw inspiration from? Our native birds provide me with endless inspiration, I have a real soft spot for the most endangered birds, a lot of which don’t get as much attention as the more common ones. I also draw inspiration from native plants and trees, I’ve been learning how to identify them in the field and striving to incorporate them into my work more. And finally, where to next for you? What does 2018 hold? I’m currently in the middle of a massive project that I set for myself. 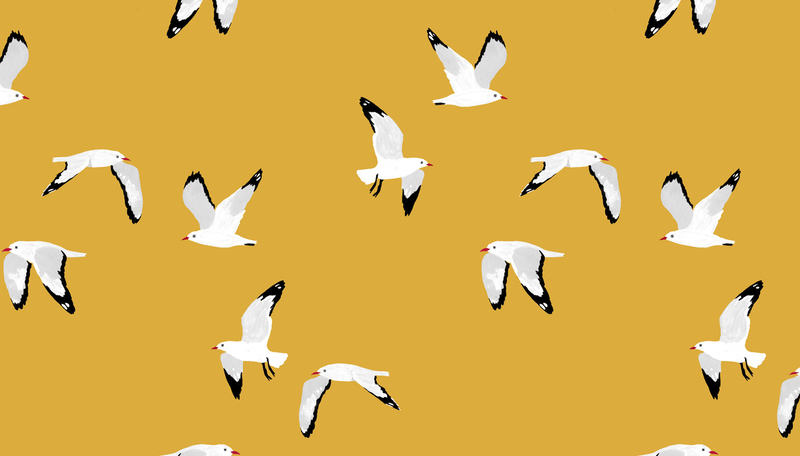 I want to make my 2019 calendars my best yet, so I’m working on an illustrated calendar featuring most of the birds of New Zealand. I have a huge list of birds to illustrate before I start putting the calendars together!